Most families we know love to go on holidays with other families. Sometimes that means going to the same spot over and over again. Other times, families like to mix it up and take turns finding a new destination. In our Best of Family Travel Awards, we asked you for your top locations for large group holidays activities. Here are the winners. The South Coast stretches from Sydney to the Victorian border, with every beach more picturesque than the last. It’s a great place to take large groups because there’s so much space, and so many beautiful coastal walks to tackle. From Shoalhaven’s fantastic seafood to Thirroul’s understated beauty, this is one of Australia’s best getaway spots. Thirroul is a gorgeous town. The beaches are never packed, the local pubs are affordable, and you can do everything from paragliding to fishing. It’s also convenient from Sydney, Canberra and Adelaide. Adventure Plus Paragliding in Otford is a must- it has spectacular views and they have 24 years worth of experience. If you’re not keen, grab a coffee at the little kiosk there and watch the gorgeous colours whirl and twirl above your head. Jervis Bay is the place to go for watching whales. They have frequent cruises in the winter month and they know their Minkes from their Humpbacks. Their pontoon boat will take you out to Currambene Creek and back. You can enjoy a sunset swim too if you want, or leave that for the younger ones. Don’t miss out on riding the Funnel Web at Jamberoo Action Park. If you hate spiders there are 14 other rides for you to pick from at the expansive water park. If you want a unique experience, you can go Snorkelling with Seals at Montague Island. Shoalhaven Heads fresh produce market, supplying everything from Oysters to veggies, is open every Saturday morning. Kids will love the gorgeous sweet treats such as local honey. Near Kioloa is Pebbly Beach campground, with 25 tent pitches available, in Murramarang National Park. There you can hang out with roos and spend a week at the beach. If you go during the off-peak it costs $92 for a family of four to spend a weekend there. Under fours are free, which makes it a great option for groups with lots of small children. If you want something more luxurious, you will enjoy the oceanfront views at Kiama Harbour Cabins. They start from $1025 but each cabin sleeps 6-8 people. The kitchen has everything you need, and the cabins also come with air conditioning. a spa bath, free wifi, TV, DVD & CD player free Foxtel and clothes washing facilities. You can watch the kids run down to the beach from your private balcony too. Where the land meets the sea spectacular views are guaranteed. Head out to Bombala, nicknamed Platypus country, to see one of Australia’s most famous animals. Bombala is an hour’s journey away from Merimbula. One of the Whitsunday’s 74 islands, Hamilton is the biggest. 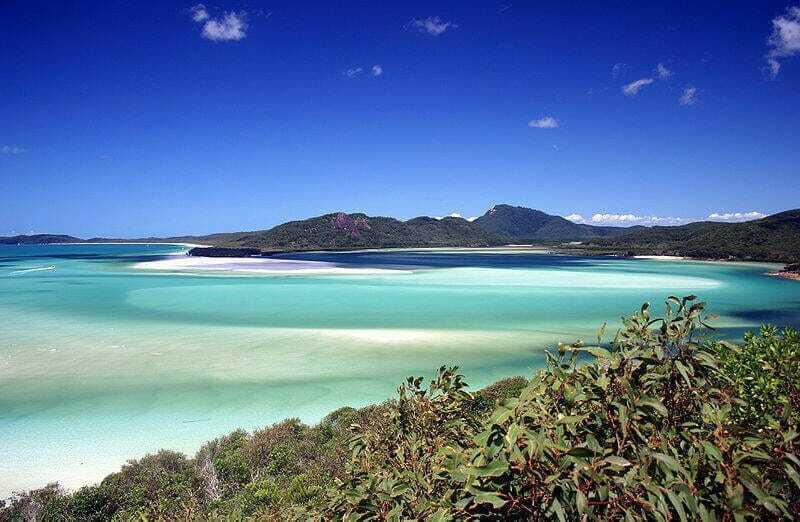 The gem in Queensland’s crown, everybody should visit the Whitsundays at least once in their lives. You can idle away hours on soft white sand, go kayaking and hang out with bizarre-looking fish. Kids will love snorkelling, relaxing by the pools and building sandcastles. They will also love riding around in golf buggies. You can rent out several rooms if you’re a large group. Plus the beach is big enough for a group picnic. So no matter the size of your group there will be room for them. You must spend a day at Whitehaven Beach. Reader’s Digest ranked it as the 2nd best beach in the world. It has soft, white sand, crystal-clear water and appears to be custom-made for your Insta account. Head down to Catseye if you’re feeling adventurous. You can rent catamarans, paddleboards, windsurfers, kayaks and snorkelling equipment there. What could be more relaxing than having a paddle on the idyllic calm of the Whitsunday islands? Why not splash out and book a night in the Presidential Suite at the Reef View Hotel. It starts at $1330 a night but you get your own buggy and plunge pool. Free WiFi i, of course,e a given. You can even let the older kids have a go at the wheel of the buggy…if you’re brave enough. Otherwise, the Reef View does have family rooms and interconnecting rooms for large groups. 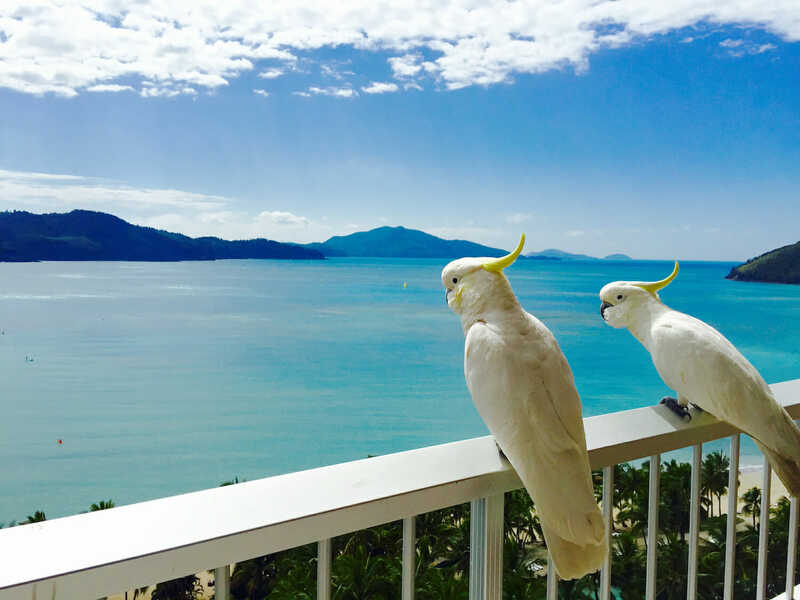 You can also stay in Hamilton Island’s Whitsundays Apartments. The family package starts from $270 a night. With that, you get free WiFi, a television, three sofa beds, a king bed, a good kitchen and a swimming pool, though not a private one. 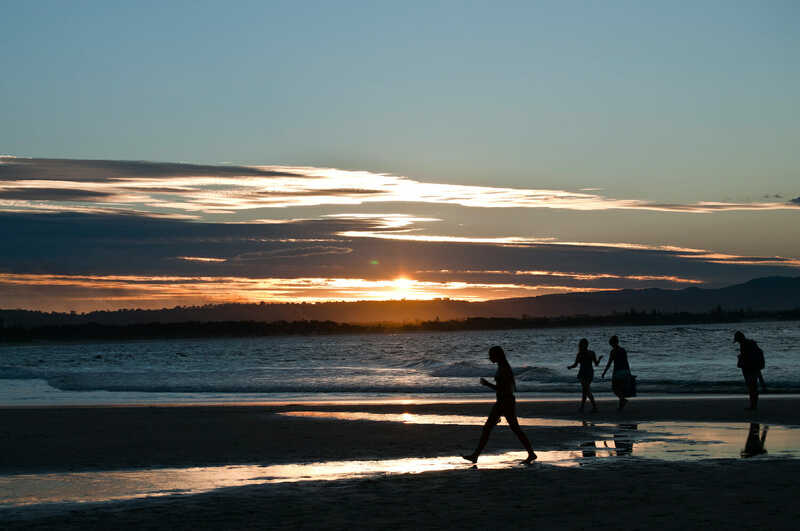 Sunset on Byron Bay is a great time for a beach jog. Picture: Shutterstock. ‘Byron‘, Australia’s Easternmost point, is surfers heaven on Earth. 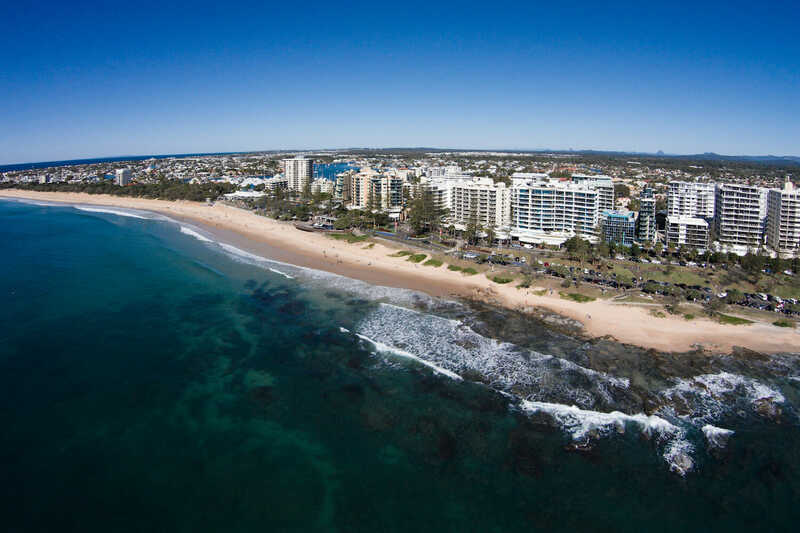 Surfing beginners will love Clarke’s beach, which has a forgiving gentle right-hander. More experienced ‘surfies’ can try taking on the pass. Its peeling right-hander is famous. Kids will love the colourful shops, brick-a-brack and burgers. You can enjoy good hiking, great coffee and Australia’s most relaxed atmosphere. You will find no better place to let the kids run wild. Surfing. Pick a board. Pick a beach. Go for your life. Byron Bay SLSC is the second oldest club north of Sydney. Surfing is in Byron’s blood. Zephyr Horses offers horseback rides along the beaches from $89 per person. This is a great group activity- you can ride alongside family and friends. Take the Byron walking track and choose your own pace. Harder than it looks, this loop takes you through rainforest, beach, grassland and clifftops to the lighthouse. It can take up to three hours so start early or finish late to avoid the heat of the day. 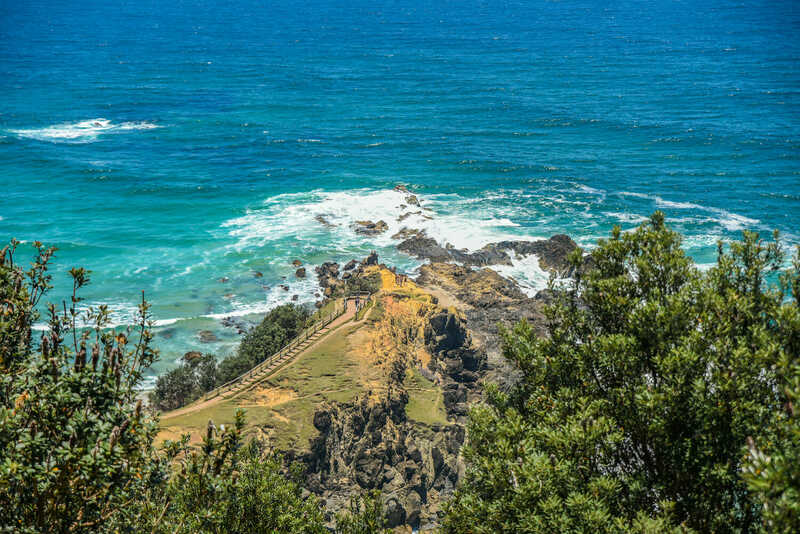 Byron Bay’s coastal walk is not to be missed. It’s got some of Australia’s finest views. Picture: Shutterstock. Byron’s Oasis Apartments and Treetop Houses are perfect for bigger groups. The apartments, which sleep five, start from around 300 a night. They have free WiFi, access to the hotel pool, a kitchen and laundry. It’s a great place for a base if you want to explore the Byron area. 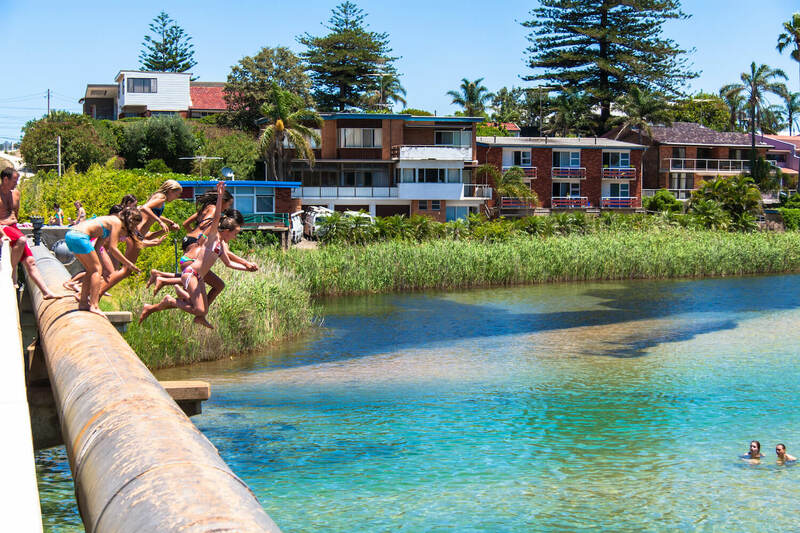 Plus you can almost dive into the water at Tallow Beach from your balcony. Byron Bay Beach Houses sleep 8-10 people. They start from $960 a night. You get free WiFi, plenty of space and great beach access. Bangalow makes for a perfect road trip. 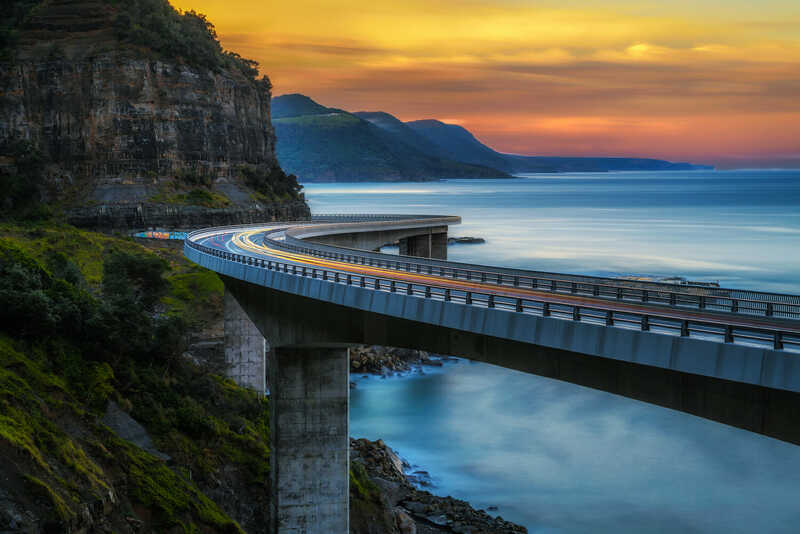 Just 7km from Byron, the snaky mountain road has scenery that will make your eyes pop. Spend a day perusing antique stores. See what you can find at Abracadabra. 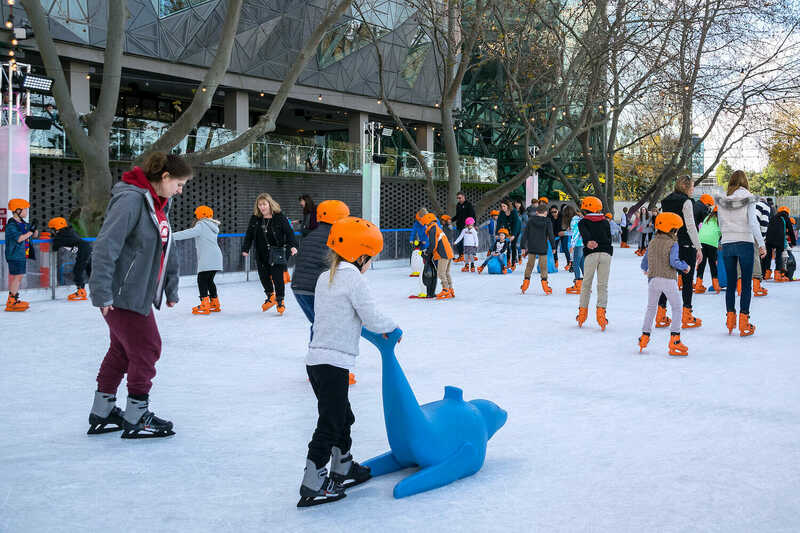 Melbourne is great in the wintertime while Sydney is a summer city. Picture: Shutterstock. Victoria’s capital is a must-visit for sports fans, culture fans and shopping fans. Grab a coffee in the laneways, take a tour of the street art and watch any one of Melbourne’s 11 AFL teams complete. You can take kids to the aquarium, sprawling parks and great museums. It’s a great city to just spend two weeks wandering around. Collingwood’s Children’s Farm is open every day of the year. 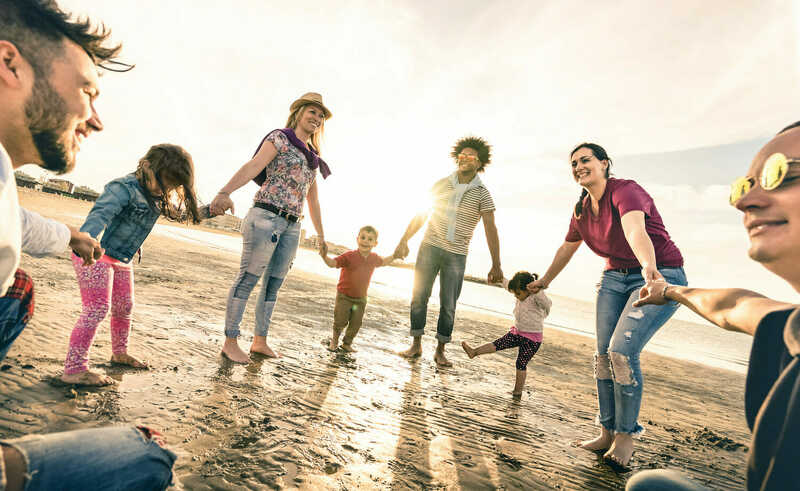 Family groups start at $10 dollars, making it a great option for groups. Hang out with horses, check out the chooks and bask in the sunshine. Hardrock has two locations. One is in Melbourne’s CBD. It has some epic rock climbs available. They take bookings for 10 or more people. Go along and race each other- where better for a bit of friendly competition? Melbourne Aquarium’s main exhibit, the 2.2 million litre Mermaid Garden oceanarium, is a sight to behold. It’s most impressive resident might be a large grey Nurse Shark. Kids will be astonished and, if they have the courage, can dive in and meet the shark. 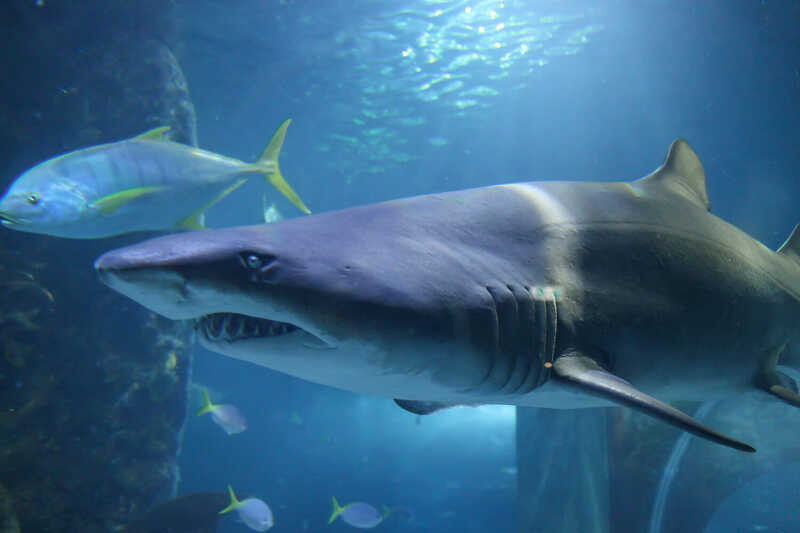 Get your teeth stuck into Melbourne’s aquarium. Picture: Shutterstock. It may appear docile but be careful- they are ranked fourth on the documented list of shark bites. Children’s tickets start from $28 and adults from $42. It’s enormous. Melbourne has a more than 1100 hotels. Melbourne’s Pan Pacific is a good luxury option. Oaks on Market has a great CBD location. If you want a totally different experience why not try out Melbourne’s camping scene. If you want to escape the CBD why not head out to Coburg. They have a drive-in cinema. Pack the whole group into a convoy and take in a movie, going via the popcorn cart of course. 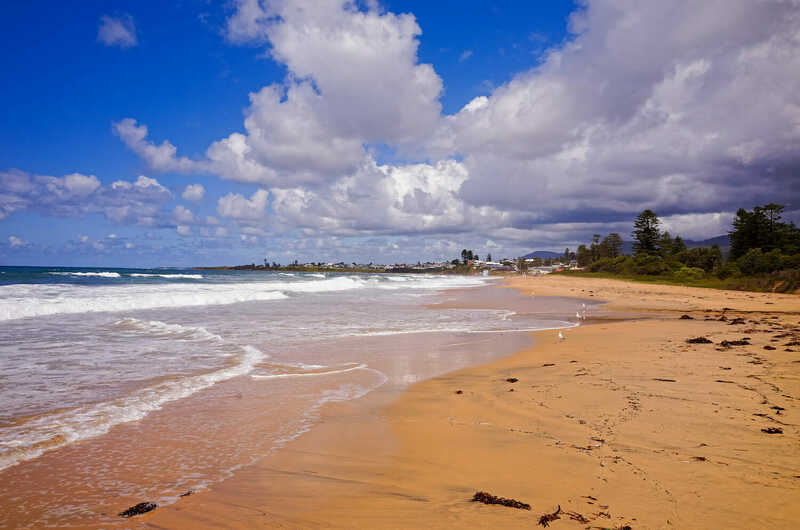 When in Sydney it’s a case of pick a beach, any beach, Picture: Shutterstock. Sydney is Australia’s largest city, host of the 2000 Olympics and gateway to the rest of the world. Forbes ranked it the 8th most important city in the world; the only Southern Hemisphere city in its top 10. It has the most famous harbour in the world, resplendent with a gorgeous Opera House and ornate bridge. 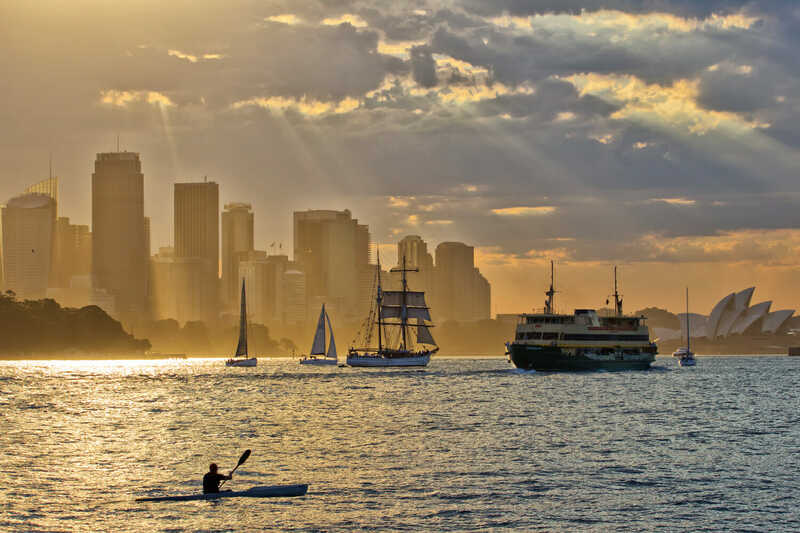 Sporting a historic CBD it also has breathtaking beaches in its Eastern and Northern suburbs. Sydney is one of the world’s most multicultural cities in the world- more than 250 languages are spoken there. The people are friendly, the attractions numerous and the weather is sparkling. The best view in Sydney is from the top of the bridge. Not suitable for those who are scared of heights, BridgeClimb is nevertheless a fantastic experience that everyone should try. Children’s tickets start from $143, adults from $168. It is your right, as a tourist, to do the Bondi to Coogee walk and swim at all the beaches. You haven’t done beaches until you’ve done Bondi. The beach volleyball at the 2000 Olympics took place on Bondi’s shores. The Manly Ferry is a great ride. The half hour journey from Circular Quay can be done on the Opal Card. After you disembark wander down the Corso, take a dip at South Steyne and attempt the Manly to Shelly swim- if you think you’re fit enough. Footwear is optional. The Manly ferry is the very definition of majestic. A daily ferry service has been in place since 1856. Picture: shutter stock. The Marriott Hotel Sydney is in the CBD and has everything you need from free WiFi to room service. It also has a pool. The Hyatt is a haven for families. It has a great pool and is really convenient for public transport as well as shopping. If you want to know the best suburb to stay in you don’t have to. We already went ahead and did that for you. Click here to find out more. Take a day, get up early and go straight up to Palm Beach. Walk down to Whale Beach and then, if you have time, check out Avalon too. It’s a 50 minute walk from Palm to Whale and 45 from Whale to Avalon. The houses are astonishing, the beaches remarkable. It’s like being in the tropics. Noosa will since have you feeling looser. Picture: Shutterstock. A heady cocktail of boutique luxury, fantastic surfing and great hiking this resort town has it all. Beachside locations don’t get much better, or more popular, than this. Groups can rent villas, hire boats and take surfing classes together. The sunsets are to die for, the choice of beaches are numerous and weather perfect. Kids will love exploring the four different markets too. Will you fall in love with the Eumundi market or the Peregian market? 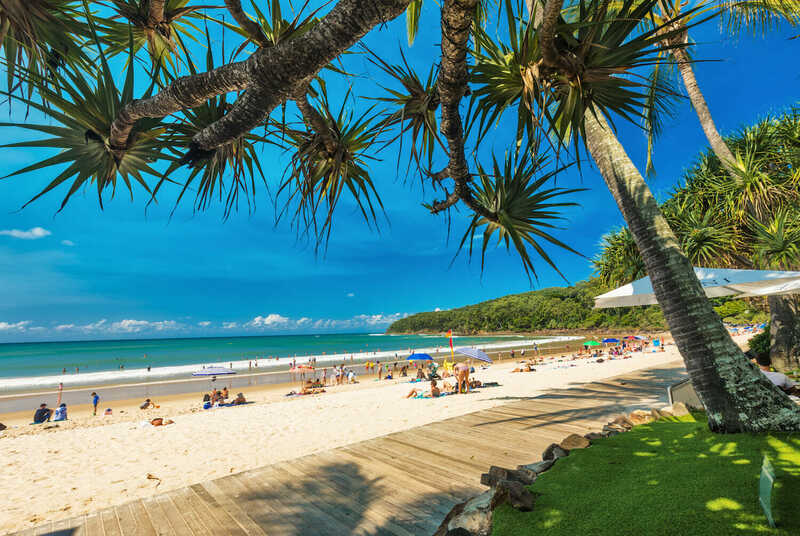 If you go in March you avoid the really hot weather and you may be able to catch some of Noosa’s famous Festival of Surfing. This festival is an international, week-long party suitable for all ages. 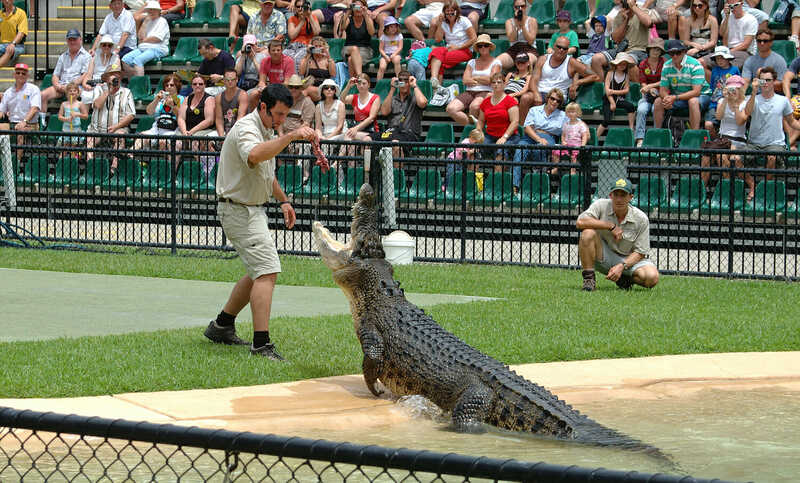 The first thing you have to do after you swim is go and see Steve Irwin’s Australia Zoo. Irwin was Australian royalty before his untimely death. Meet Echidnas, Crocs and Wombats and find out what they spend their lives doing. Walk some of Noosa National Park’s trails and see if you can spot the elusive emu. Watch out for the potentially deadly Cassowary however. Hang out at Aussie World, which celebrates the best parts of Australia’s rich culture. It has mock-up of an old-school country watering hole, water slides, ghost trains and a ‘ballroom dance’. Steve Irwin used to be crocodile hunter. Picture: Shutterstock. Pepper’s Four Bedroom Tree Top Villa can sleep nine. It has a great pool for the kids, is close to the beach and has free WiFi. You can comfortably fit a large group at Peppers. It is close to two beaches, including Noosa’s main beach, and has lots of places for the kids to explore. Noosa has an open air concert held on the second Sunday of every month on Peregian Beach Park between 1 and 5pm. It’s a donation cost. Kids, dogs and parents are all welcome. Find out more here. The Sunshine Coast is great for families. Picture: Shutterstock. Exotic wildlife, rolling beaches and fantastic food all meet at the crossroads on the Sunshine Coast. Surfing, swimming, hiking and unique restaurants- in this town there is something for everyone. Young or old, everyone will have a memorable week filled with sun, sand and sea. Australia’s original inflatable waterpark is sure to keep the kids distracted all days. Full of big slides and ladders, Aqua Fun Park is a perfect activity for a large group. 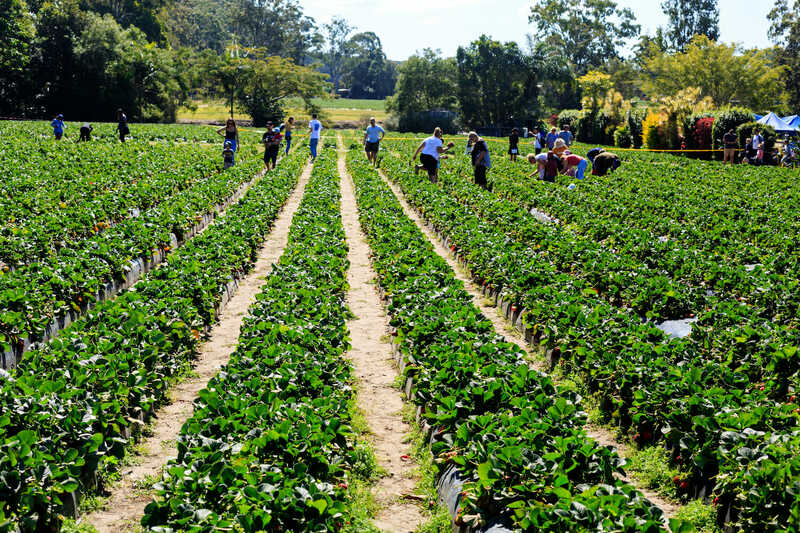 Strawberry picking is a great winter activity everyone can get into. It’s free but the cost of your strawberries will depend on the weight and current wholesale market price, so don’t pick a thousand. Thousands of strawberrys await you. It’s a great group activity. Picture: Shutterstock. Sand Dunes’s beachside villa can comfortably sleep 10. It’s a great option for surfing nuts. All members of the family will enjoy the large collection of pools in the resort too. With free Wi-Fi, excellent kitchen facilities and a location between the airport and the beach it’s perfect. You should try Glamping. More suited for smaller groups, the lit-up tents at night are still gorgeous. Fairylights, fire and a sunset are a fantastic combination. If you haven’t tried it before why not go for it now. Pitch Luxury are a good option; the family tent options sleep five and cost $245. Check out Baxter Falls. It’s a great walk, complete with its own suspension bridge. The 6 km, two hour walk is suitable for all ages but some of the inclines may be taxing for older or younger members of the group. 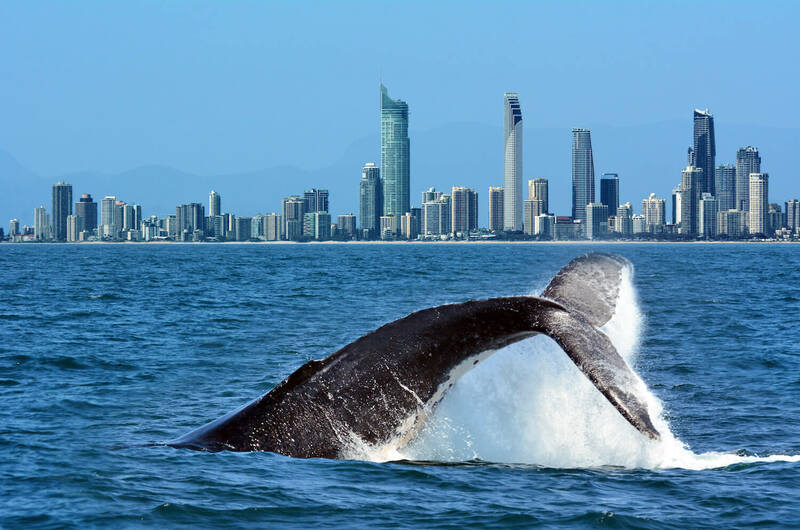 You’ll have a whale of a time on the Gold Coast. Picture: Shutterstock. Yes, this is your favourite destination to take a big group. Great surfing, swimming and plenty of opportunities to relax await you and your family on Queensland’s Gold Coast. You can learn how to surf, rent bikes and take the kids snorkelling. This is natures playground and you can spend all day in it, then go to bed in luxurious comfort. SkyPoint Climb is Australia’s highest external building climb. At the end of it you will get an unbeatable view, then you can have dinner at SkyPoint. The Currumbin Wildlife Sanctuary is like family to most Gold Coast residents. It has been around forever. You can meet all kind of animals from frogs to owls and take in a daily show too. 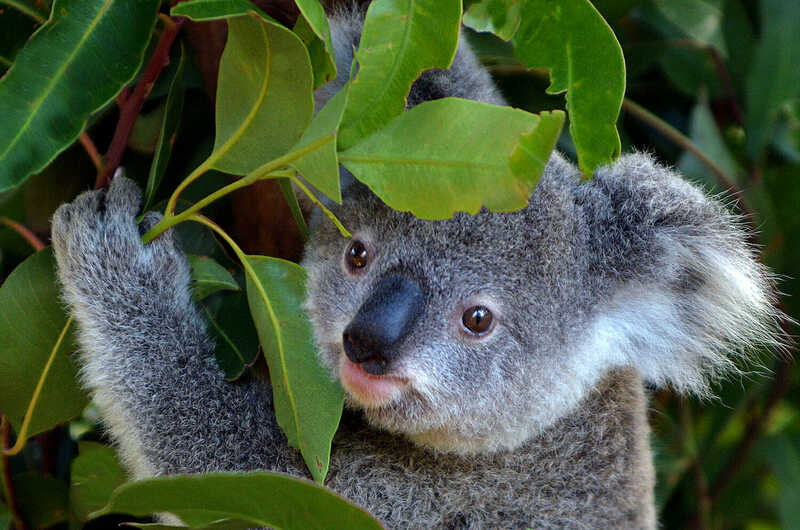 The Koala’s closest living relative is the Wombat. Picture: Shutterstock. You can visit the first sporting museum in Queensland. The Gold Coast sporting hall of fame has names such as Craig McDermott enshrined in it. McDermott had a 10 wicket haul twice during his career as an Australian bowler. Ashmore Palms is orientated towards making kids happy. It has free activities for children, complimentary WiFi and an awesome pool. The Rainforest Retreat cabin sleep six and starts at $310 per night. Take the Treetop Walk. It is wheelchair accessible too. Buried deep in a world heritage listed national park, this is a must visit.